As I have mentioned about a million times before, silk is a slight obsession of mine. Add to that I'm a material snob & compulsive op shopper... which brings me to today's DIY! 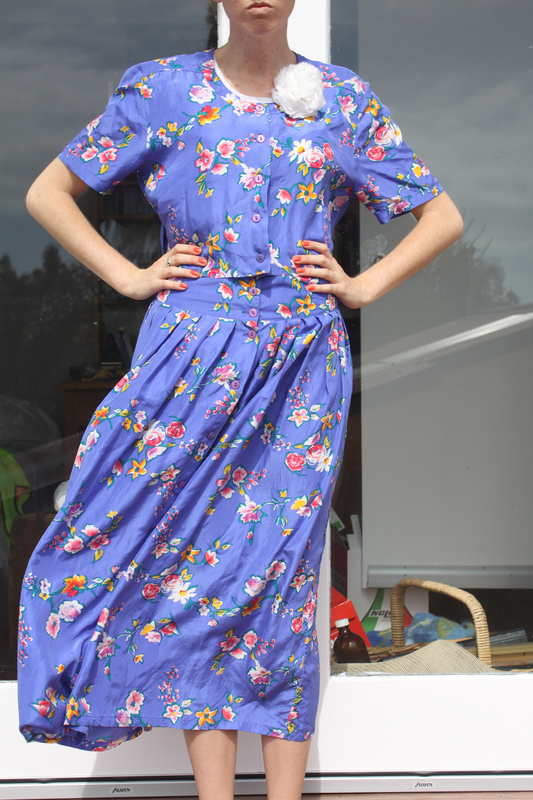 I picked up this (very ugly & dated) granny dress for $5 purely because the fabric was so beautiful, but without knowing what I'd do with it. A quick glance at the waist seam showed it was completely choppable, so I just chopped off the top very neatly and tidied up the edges. Fastest silk midi skirt creation ever. Happy Australia Day to everyone, Australian or not! Love what you did! Great idea! Oh wow! It looks amazing as a midi skirt! Love it! great diy project. the skirt looks lovely on you! I love happy ending stories like this! Found a gorgeous emerald green vintage blazer with polka dot lapels over summer for £1, all it needed was the lapel to be chopped off and there's a statement piece right there! This is so amazing! Love it! Hope you had a great Australia Day! P.s, I nominated you girls for the Versatile Blogger Award! I love your blog and would love to see your responses!